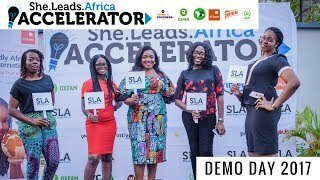 The SLA Accelerator is a 3-month program designed to identify, support and fund the next generation of Nigeria’s brightest female entrepreneurs. The winner of the programme will receive N2 million from SLA. We are looking for Innovative & Tech enabled businesses. A tech-enabled company is one that leverages the use of technology to enhance its business operations. Submit your application! Applications open April 16, 2018 and close May 20, 2018. We will not accept any late submissions. You must upload your pitch deck to your VC4A profile in order for your application to be complete. Make sure you join the She Leads Africa community to gain access to our application tips, a free downloadable guide on how to create a BOSS pitch deck and an invitation to a private webinar with our cofounders where you can ask your questions and hear directly from them on what they’re looking for. This 2018 SLA Accelerator is run in partnership with the Work in Progress! Alliance – a consortium of Oxfam, Butterfly Works and VC4A focused on driving job creation and youth employment in Nigeria. This year’s cohort is also sponsored by Lagos Innovatesand Lagos State Employment Trust Fund. She Leads Africa is a social enterprise dedicated to supporting young African women and their journey towards professional success. The organisation has been featured on CNN, CNBC Africa, Black Enterprise and Fox Business and has more than 300,000 members across Africa and the diaspora. Lagos Innovates is an initiative of the Lagos State Employment Trust Fund and was established to help position Lagos State as a global centre for technology startups in Africa. It is focused on helping founders, developers and investors with access to learning resources, early-stage investment capital, peer networks and high-quality workspaces and infrastructure.